This Welcome banner is free in my TpT store. I have been suuuuuuuper busy getting my classroom decorated and "almost" ready for my little firsties to show up. Those of you who have been here for a little bit know that this is only my 2nd year in first grade and my previous experience was in 3rd and 4th grades. 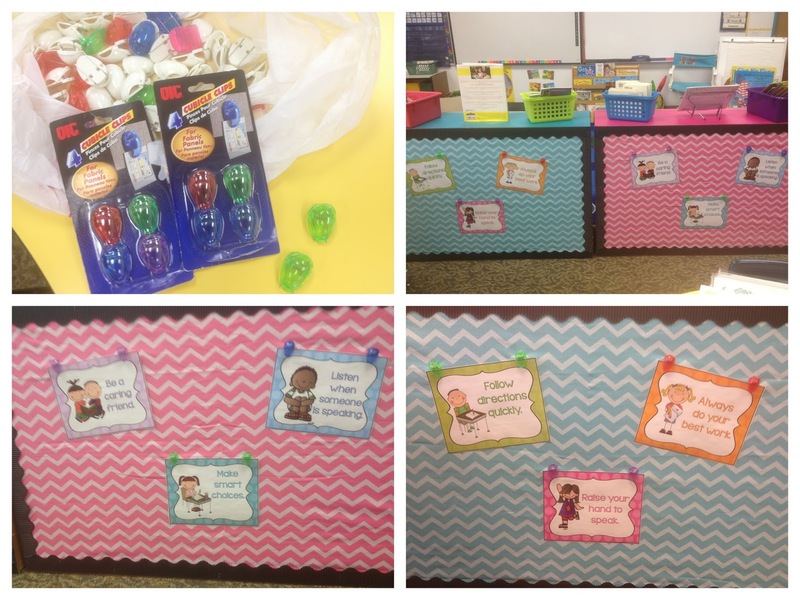 At the start of the year last year I had no idea how my teaching would be SO different in 1st grade and therefore my room also need to be different. My classroom last year worked, but I knew all year long that it wasn't as good as it could be. So I rearranged about 25 different times - no joke! I am so not one of those people who can just visualize and it all turns out ok. I need to physically move things to new places to SEE how they will look. Often times I end up moving them right back where they were, too. Believe me, the custodians just shake their heads and smile when I come asking questions like: Can I borrow the dolly? How about those roller thingies that you put under the shelves? It's an adventure - that's for sure! First up - this file cabinet! YUCK!! At some point, probably 50 years ago, someone attempted to help this poor thing along with some blue contact paper on the top, or at least I think that's what it is. I have had it in my room for almost 10 years and I just couldn't take the blue anymore so I finally did something about it. It was super simple - just some chevron wrapping paper from Target and some black border from JoAnns. Nothing too fancy, but a HUGE upgrade. Next up were these untreated wooden bookshelves. Everyone in our school has these in their rooms. I've been told that many years ago these were built by someone in the district and given to everyone. 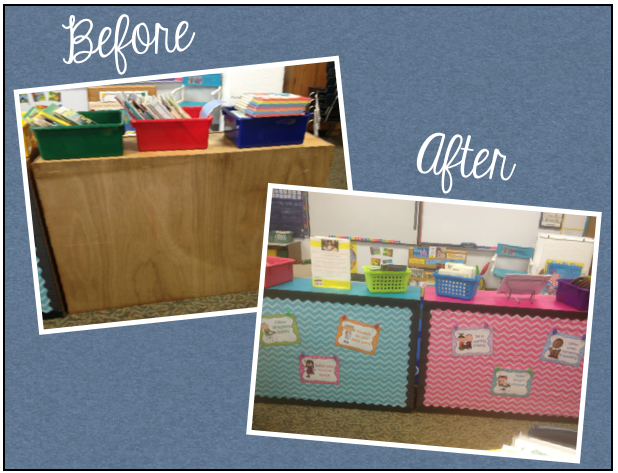 They aren't awful, but since I placed them in the middle of my room to divide my rug area from the students' tables I NEEDED to do something about it. Again - nothing too fancy (and not permanent like paint because that was a no-no). I covered the backs with fabric from JoAnns and the same black border. Then I found matching contact paper for the tops. I definitely like this WAY better than just the wood and it gave me the perfect place to hang my rules. I had planned on just using tacks or something like that to keep my rules on the back of these bookshelves until my AMAZING colleague next door came over with these cubicle clips. They were PERFECT for using on fabric because they have two sharp metal pins on the back and plastic clips on the front. It was so awesome of her to just pop over with these treasures and now I can take my rules down those first few days as we are going over them and just clip them right back up when I'm done. I love the people I work with! I had a little fabric leftover so I used it to cover this little cork board I keep next to my desk. Then I used black duct tape to go around the wooden frame. 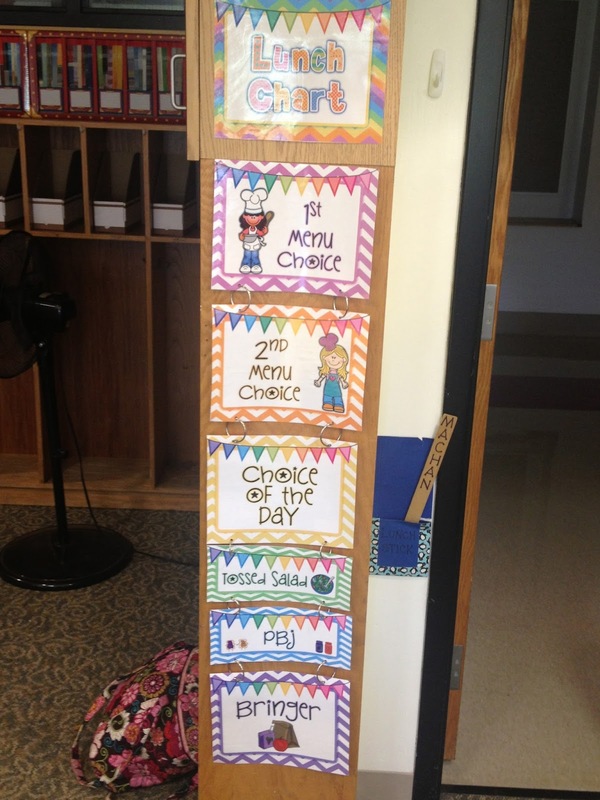 I finally hung up my Lunch clip chart. This is available as a fan freebie on my Facebook page. I made and hung up my polka-dot number posters. (When I get around to it, I will be posting these along with my rules and the nametags below that all match. I know it is too late for this year for most people, but maybe next year). I had to make my own nametags because I was not loving the ones I had and I really wanted to have a 120 chart on them along with an alphabet and number line. I also needed them to be smaller than those huge ones they sell because of the room I have on my tables. I printed these on card stock and laminated them. They are just waiting for my little ones' names. Then we move out into the hall - well first my door. This year I plan on using this cute little chalkboard sticker from Target as a place to put a daily password. Each morning, students will have to read the password and tell me what it is before entering the room. I will use this for our spelling words and sight words. And since it's a chalkboard, it is easy to change. I wrote the Today's password is . . . with a silver sharpie, but I will use chalk for the words. I need to actually go buy some chalk now - all I had was sidewalk chalk which doesn't work so well. Here are my hallway bulletin boards. I will be writing the kids' names on the ladybugs, but I'm waiting because I keep getting more kids added to my list. And finally, this is the wall outside my room where I will hang student work. This banner is from my Welcome Back Pack. I will be hanging up our All About Me banners when they are finished. Do you think you will be selling your desk tags in your TPT store. They looks great! Thanks! 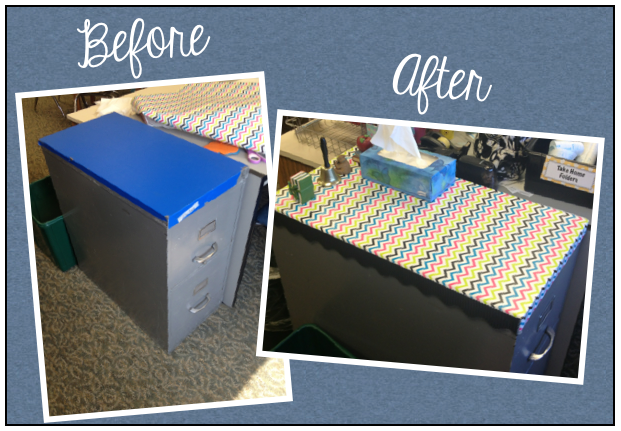 Loving the chevron fabric makeover! !